sponsor a child betwen 15-18th Dec! Calling all bloggers out there! Christmas is coming & Santa don't like naughty kids! (hey u adults, it's never too late to turn back time too). Start blogging now and you'll not only get a kid to the movies for free but also make it into Santa's Good list! If you're a blogger, this is what u can do! United International Pictures (UIP) has agreed to sponsor a number of movie tickets; your one blog post will send one of these kids to the movies! Blogs can be a very magical tool this season, and the more people who get to know about this project, the more likely someone would come forward to help. Don't just blog, make it interesting, catchy so that people would stop and read what you're trying to say. Sticky it make people notice this project! If you're not a blogger you can still help! Sponsor a kid! from as little as RM10 to RM150. You can also sponsor a kid as a gift to your love ones! A gift card that comes nicely packed with an inspirtational quote and ribbon will be given tou as a gift to your love ones this Christmas (what an amazing idea!). Besides, u can spread the word to everyone or get them to sponsor a kid too! Do what u can! pool your resources! make it happen! For more information about Project Gift a Kid, Sponsor A Kid and what you can do to support the project, click here. back-to-school material - books, stationery, uniforms etc - for the 2009 school year, to 100 underprivileged kids, aged between six and 15 years. leadership and confidence by conducting interactive sessions and educational trips. kids to be kids by organising “fun” trips. The first of these is a movie outing (possibly on Dec 19), the tickets to which are sponsored by United International Pictures. Each Blog gets a kid to the movies for free!!! A home for HIV+ children and their affected siblings under the Pertubuhan Wanita dan Kesihatan Kuala Lumpur. Many of the children from this school come from the surrounding low-cost flats and squatter areas. Most of them can’t afford school uniforms, let alone school fees. thanks tam, it's a very good post. much appreciated. btw are you coming for the charity car wash tomorrow? Sorry I can't go to the car wash as I'm involved in church activities until christmas this month. We're practicing for the christmas perfomance every free time we have. U & the fellow good people of ambp enjoy yourself yeap! Heard Hurley is going 1/2 day to help out. We'll be visiting the kids of Rumah WAKE 1 (the home for HIV+ kids) this Saturday, Dec 20 at noon. If you're free and in KL, do join us. 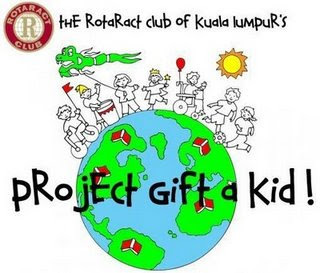 Drop me an email at rotaract_kl@yahoo.com.sg if you're interested so I can send directions.